House prices in England and Wales have drifted slightly lower in the past few months, according to the Land Registry. Its latest survey of all completed sales shows the average price rose by 0.8% in April to £163,083. However, the average sale price in the February to April period was 1% lower than in the previous three months - the best indicator of short-term trends. Prices in April were 1.3% lower than a year ago, and monthly sales have also fallen, by 14% in the past year. These figures reflect the general stagnation of the market, which has been due to severe rationing of mortgage funds by lenders, and fears of higher unemployment among would-be buyers. The Land Registry survey recorded distinct regional variations in house price movements. In London, house prices jumped 3% in April, to an average of £352,187. "London's annual change now stands at 5%, which is much stronger growth than that seen by any other region in England and Wales," the Land Registry said. "Only London and the South East experienced increases in their average property value over the last 12 months." 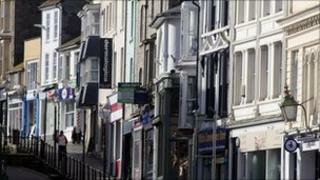 By contrast, prices in the north-east of England fell by 8% in the year to April. Last week, one of the UK's biggest lenders, the Nationwide, said the housing market was reflecting the lacklustre state of the economy. The overall volume of mortgage lending remains subdued, suggesting there will be little improvement in activity, or revival in prices, in the coming months.